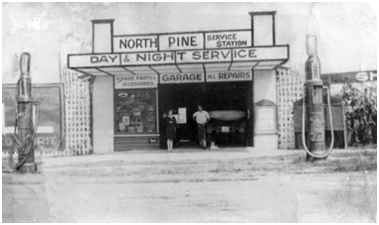 In 1929, Gordon Jackson (1908-1988) opened a new business known as the ‘North Pine Service Station’, the first motor garage to be opened in the Petrie area. The garage was initially located at what is now the south-western corner of the River Street/Cooke Street intersection opposite the present Petrie Hotel. Prior to this time, petrol could be purchased in limited quantities from a few general stores, including Twible’s store located nearby, but there were no local mechanics. Jackson, who had arrived in Petrie as a young, newly qualified motor mechanic, first leased the house and land, but he was able to purchase the property a few years later. The house was elevated on high stumps, allowing him to establish the garage in the area in front of and underneath the house facing what was then the main road. Given the economic situation prevailing at the time, and Petrie’s situation as a small township, this was a brave decision. In 1937, due to the opening of the new road bridge over the North Pine River the year before and to capitalise on the changing pattern of road traffic, Gordon Jackson moved his motor garage to the present location of North Pine Motors. Although it was at first only a service station, the business expanded rapidly after the time of the move. A Ford franchise was obtained and held until the mid 1950s. The major turning point came in 1950 when a family company was formed to operate the business. The granting of a Holden franchise in 1951 allowed North Pine Motors to expand even further and in 1958 a new showroom was constructed north of the present premises in the area now occupied by Village Motors. The farm equipment section had been established in 1957 with North Pine Motors becoming the major Massey-Ferguson dealer north of the Brisbane River. The original timber building at the new site was pulled down and replaced with a brick building in 1961. It was this building which was finally demolished during the last week of March 2003 to make way for the current premises and for the Department of Main Roads to reclaim some of the land to facilitate the widening of Gympie Road. On 31 August of the previous year, the last motorists had filled their tanks at North Pine Motors, but the business continued by maintaining the farm machinery and mower sales division.